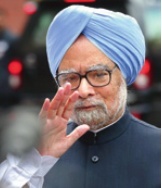 Prime Minister Manmohan Singh, rejecting the CAG’s claims in its coal block allocation report as “misleading” and “flawed”, on Monday took the BJP headon and accused it of thwarting his government’s efforts to bring in a policy of competitive bidding. Amid a din in both Houses of Parliament, he also dared the saffron brigade to debate the issue on the floor of both Houses. Speaking both inside and outside Parliament, Dr Singh said he was not running away from taking full responsibility for decisions taken by the coal ministry when he had held the portfolio himself. He, however, declared that the allegation of impropriety “is without any basis and is unsupported by facts”. He read out his statement even as the uproar by the BJP continued for the fifth day in a row. After reading a few paragraphs, he laid the statement on the table. Daring the BJP to hold a House debate to let the country judge the truth, he declared: “We have a very strong and credible case as the CAG’s observations are clearly disputable.” As the BJP continued to create a ruckus, no legislative businesses could be transacted.